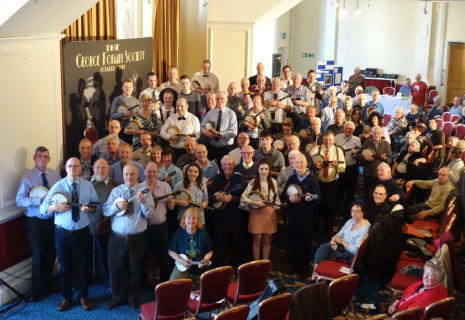 The first convention of 2018 heralded the return of our old friend, Frank Skinner, who was with us at the March 2010 convention when the “Frank Skinner on George Formby” show was being filmed. 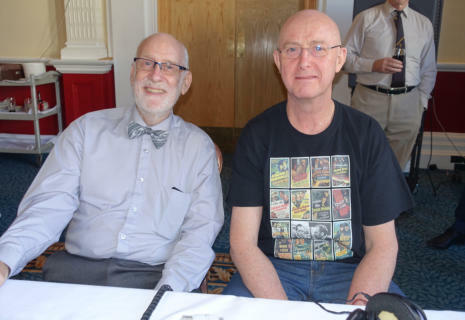 Frank returned this time with a BBC film crew to interview John Walley and GFS President Gerry Mawdsley about the forthcoming concert at the Royal Albert Hall in London. 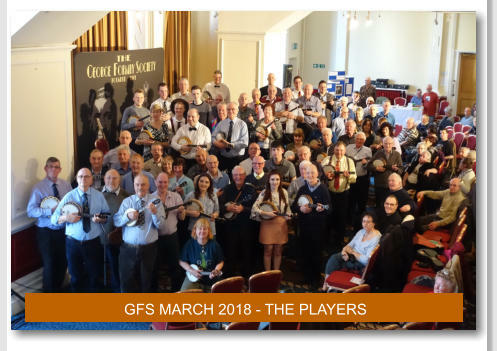 The film crew then arranged for all the playing members that day, to be on stage for a rendition of “Leaning on a Lamp Post” so hopefully many of our membership will be seen on BBC TV in the near future. 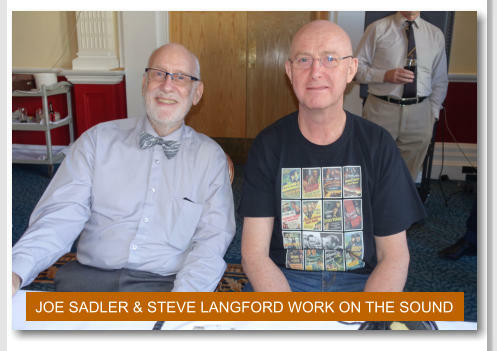 The convention itself was as good as any other with the Lancaster Suite almost full for most of Saturday. It is a long break between November and March but of course these days there is usually a branch somewhere to help us get through the dark winter months. 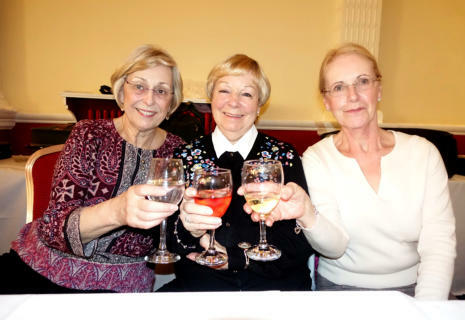 Two people who all the regulars missed this time were Alex and Kitty Barrett who sadly could not attend owing to health problems. 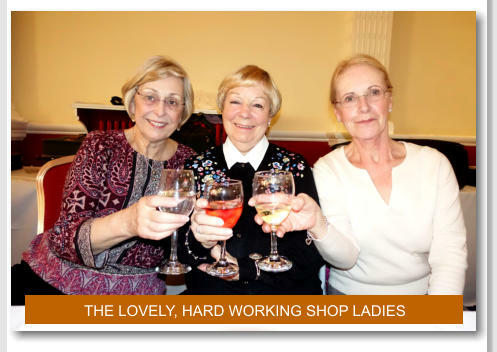 Their daughter Mary, her husband Andy and another son-in-law in Trevor Weston, all made the trip and we are hopeful that by September, Kitty and Alex might just make a reappearance. Whilst we certainly missed Alex and Kitty, we welcomed back Jon and Pam Baddeley who missed the last year owing to other commitments; it was nice to see them back again. 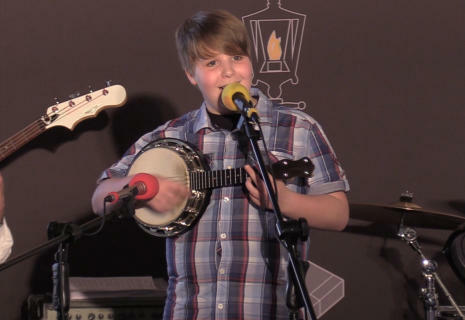 Another great line-up to entertain us all was provided throughout the weekend and to get the ball rolling, we had 12-year old James Fleming singing George’s favourite, “Leaning on a Lampost.” James has made astonishing progress in the few months that he has been with us and has rapidly made his mark on all who recognise a good Formby player. 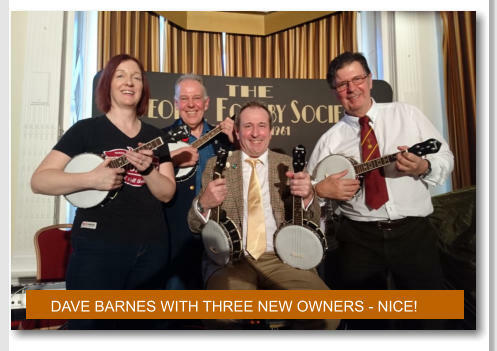 Long-term GFS member Dave Barnes travelled up from his Essex home and brought with him (along with his mate Mike O’Dywer,) four beautiful Baby Barnes banjo-ukes. All of course soon found new owners. Dave makes wonderful instruments which sound great; I got the chance to play one on Friday afternoon and the action and setup was just right, Dave takes such pains to get the instruments not just sounding right, but also looking good as well, a real craftsman. 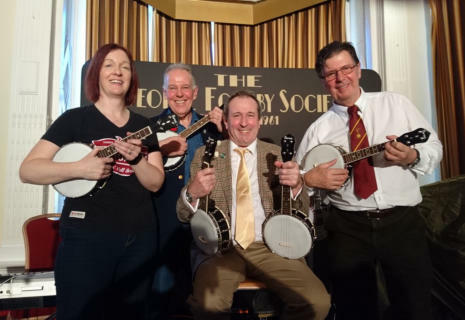 Andy Eastwood found some time in his busy schedule to be with us again and gave us a few performances over the weekend, another professional entertainer Sean Moyses, brilliant exponent of a full size banjo was also a welcome Formby friend who stayed for the weekend. Unfortunately I had to leave Blackpool after the Sunday afternoon concert due to an unavoidable appointment on Monday morning, I am told though that the Sunday cinema was quite full and that all who stayed until the end of Sunday night had a great time in the company of President Gerry Mawdsley together with the always entertaining members on stage. Hard working people who gave all or a part of their weekend to help to ensure that the GFS convention ran as smoothly as we have all come to expect and surely deserve a mention were Frances Lister, Kate Howard, Bruce Cox, Dennis Lee, Gill Walley, Kathryn Pollard, Dolwyn Shone, Pat Taylor, Geoff Shone, Christine Kershaw, Steve Langford, Joe Sadler, Lesley Fowkes, Jeanette Austin, Johnny Key, and Ray Reynolds, all those named people and probably more, all helped to contribute to such a great weekend and all deserve a mention on this page - plus of course, our band who again, for the love of music and the love of the Society will devote all their weekend to our enjoyment and the thrill of allowing members to be supported by “proper” musicians - and not forgetting of course, our hard working committee. DAVE BARNES WITH THREE NEW OWNERS - NICE!